Mechanical properties of the material you are selecting for components are most important for the successful running of a machine. In engineering, Mechanical Properties of the Metals are those properties which are associated with the ability of the Material to Resist Mechanical Forces and Load. 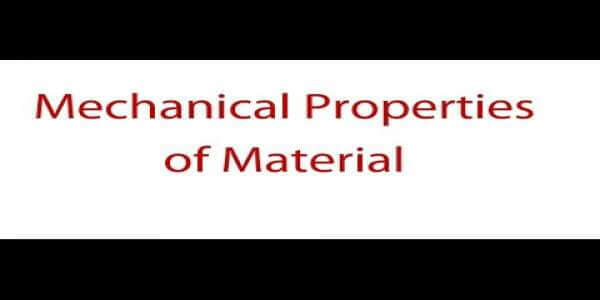 A material posses various properties such as chemical properties, magnetic properties, thermal properties, electrical properties, and mechanical properties etc. Here in this post, I am covering the information about the mechanical properties of a metal. Hope this will help you in designing the machine component. The Internal Resistance offered by a part to an externally applied Force is called as Stress. It is the ability of a Material to resist the externally applied Forces with Breakdown or Yielding. It is the ability of a Material to Resist Deformation under Stress. It is the Property of a Material to regain its original shape after Deformation when the External Forces are removed. It is the Property of Material which retains the Deformation produced under Load permanently. This Property of Material is important for Forging and in Ornamental Work. It is the Property of Material enabling it, to be drawn into a wire with the application of Tensile Force. A Ductile Material must be both Strong and Plastic. It is the special case of Ductility which permits Material to be rolled or hammered into Thin Sheets. It is the Property of a Material to resist Fracture due to high impact Loads like Hammer Blows. The Toughness of a Material decreases when it is heated. It is the Property of the Material of breaking of a material with little permanent distortion. Brittle Materials when subjected to Tensile Loads snap off without giving any sensible elongation. It embraces many different properties such as Resistance to Wear, Scratching, and Deformation etc. 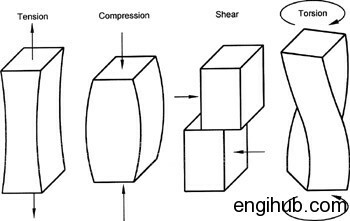 When a part is subjected to a constant Stress at High Temperature for a long period of time, it will undergo a slow and permanent deformation called Creep.